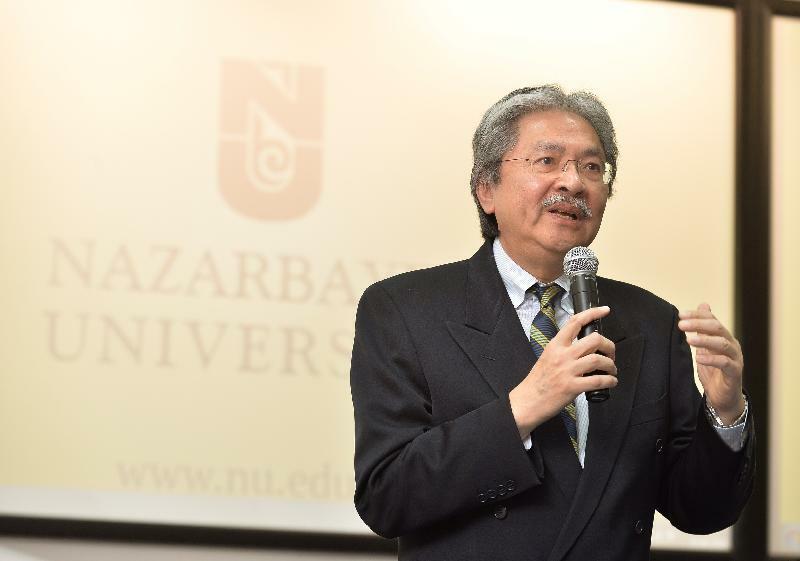 It is a great pleasure, and indeed a huge honour, for me to be here with you today in the Nazarbayev University, the premier academic institution in Central Asia, and the most vibrant institute of learning in Kazakhstan. This young and exciting university is well recognised as a fertile breeding ground of well-rounded, versatile and conversant talents who aspire to contribute to the development of your nation, to make Kazakhstan, and indeed our world, a better place for everyone to live in. It is also extremely humbling for me that this is the place where President Xi of China delivered his monumental speech three years ago to introduce to the world the blueprint of the grand and visionary Belt and Road Initiative. President Xi's speech and his state visit in 2013 drew the world's attention to Kazakhstan, the fast-growing economic powerhouse in Central Asia and the vital gateway connecting Asia with Europe. I must congratulate you first of all that your great country and the stunning capital of Astana will be taking centre stage in less than nine months, when Expo 2017 - Central Asia's first world's fair - opens here. In fact, Kazakhstan's international standing was already in the spotlight in late June, when the country was elected to the Security Council of the United Nations as a non-permanent member, with a two-year tenure beginning in January next year. And, last November, Kazakhstan became a member of the World Trade Organization, the WTO, demonstrating the country's remarkable achievement in staking its place as a regional economic dynamo and a key player in global trade in just 25 years of nationhood. As a staunch supporter of free trade, Hong Kong understands all too well about the power and the importance of free trade and the benefits of a free market. As Financial Secretary of Hong Kong for the last nine years, I do take pride in Hong Kong's track record in upholding the principles of economic freedom and the operation of a free market all these years. In June this year, we regained the title of the most competitive economy in the world, according to the 2016 World Competitiveness Yearbook released by the International Institute for Management Development. And among other accolades accorded to Hong Kong by prestigious international institutions, the Washington-based Heritage Foundation has named Hong Kong the world's freest economy for the past 22 years in a row. Hong Kong also topped the annual "Economic Freedom of the World" report published by the Cato Institute and the Vancouver-based Fraser Institute. They have done so every single year since the report first came out back in 1996. In the next few minutes, I would like to share with you the three most important factors that I believe are fundamental to Hong Kong's sustained achievement as an international commercial, trade and financial centre. I shall only briefly mention these factors so that we can have more time for questions later. The most essential of all, the rule of law. It is the indispensable building block of Hong Kong's continuous stability and prosperity. Hong Kong's legal structure provides a robust and transparent framework of protection for all the entities in Hong Kong, jealously guarding the rights of people and businesses. The concept of rule of law is widely recognised and is well respected in Hong Kong. And our laws, which are constantly under review to ensure that they continue to serve their intended purposes amid changing circumstances, are effectively enforced by relevant government agencies. To uphold the rule of law, it is equally important that the judiciary remains fully independent. And that is exactly the guarantee that has been enshrined in the Basic Law of Hong Kong, our constitutional document that underlines the "one country, two systems" arrangement. The rule of law is also fearlessly and rigorously guarded by our hugely vocal media - local and international. The rule of law, together with an independent judiciary, are the twin foundations of social stability and order in Hong Kong. They offer an important and civil alternative for resolving conflicts and bringing justice to society. Under the rule of law, Hong Kong has established and maintained a transparent, fair and predictable regulatory regime. All persons, businesses and organisations, regardless of nationality, are treated exactly the same. Again, that creates the necessary sense of security and certainty that are essential for an economy to develop and flourish. The second and equally essential key factor that contributes to Hong Kong's success is our talents, our manpower, our human capital. Hong Kong's multicultural, multi-talented pool of services professionals - in business, finance, accounting, law, architecture, engineering, healthcare services, management and more - is another massive advantage of ours. And where do all these talents come from? The answer is simple - first and foremost, our quality education system. In areas where local skills are not available, we are open to talents from any corner of the world. Just walk around the central business district in Hong Kong and you will hear a multitude of tongues, many of which you will not be able to recognise. I believe education is the most powerful tool that has ever existed in our world. Education is the engine for transforming society and in driving the economy forward. Education instils knowledge in individuals, and knowledge, in turn, becomes the source of creativity, the spark for inspiration, the fuel for innovation. The collective ingenuity of individuals can become the power that creates a better world for everyone. It is also the greatest equaliser that accords everyone, rich or poor, the same opportunity to excel, that optimises everyone's potential, and that gives members of the younger generation a fair chance to succeed. This is the reason why we are doing our utmost to provide the best possible education to our future generations, from primary schools to tertiary research institutes, in order to ensure that we have an abundant supply of competitive and knowledgeable talents that can drive us forward, that can help us maintain our position as a major international metropolitan city and a competitive economy in this pervasive digital age. More importantly, in so doing, we have new generations of young people who can thrive for themselves, who possess the ambition to better themselves and their families, and who have the ability to nurture changes in our society. The Hong Kong Government attaches great importance to education. Indeed, education has been the single largest outlay in any annual budget, accounting for about one quarter of our recurrent expenditure this year. With years of hard work and dedication, Hong Kong now has established more than several world-class, acclaimed and international universities, grooming young talents who possess not only profound knowledge of a wide range of disciplines, but also a global vision that is essential in meeting the new challenges of the fast-changing, knowledge-driven global environment in the 21st century. I am certain this is also the very vision of Nazarbayev University. Indeed, in this era of globalisation, the ability to acquire new skills, to learn new algorithms, to adapt to different environments and conditions, to embrace changes and to venture into new frontiers are essential competencies in meeting the many challenges as well as seizing the many opportunities of tomorrow. In this globalised world, learning is not limited to the confines of the lecture halls, study rooms and laboratories. We need our students to understand the world around us. We want them to explore this world of ours, to understand other cultures and to become responsible global citizens. We have numerous exchanges and internships for our students to allow them the opportunity to go abroad, to learn and to grow, not just academically, but also socially, culturally, intellectually, and even politically. We also welcome foreign students to come and study in Hong Kong. 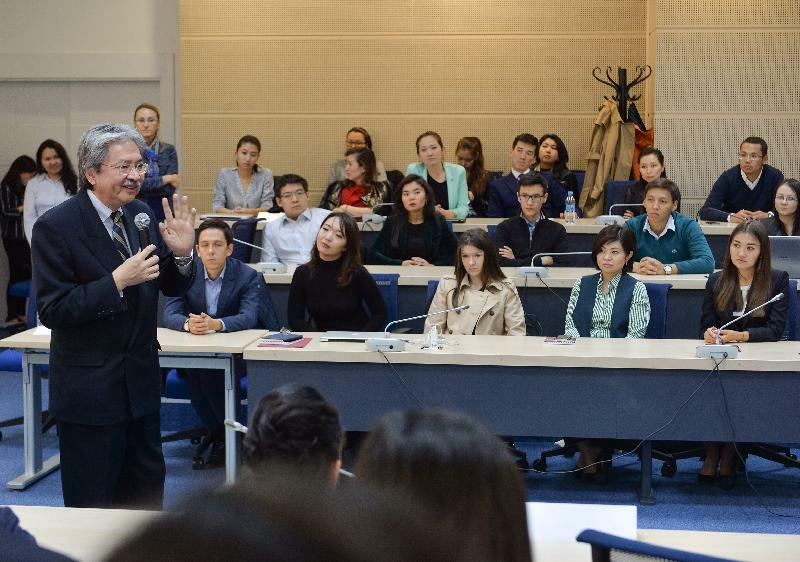 It is a competitive process, but each year there are thousands of overseas students studying in Hong Kong, including a several dozen from Kazakhstan. And I look forward to seeing more of you and your fellow students learning and studying in Hong Kong. Let me now turn to my third and final point. Hong Kong's success, no doubt, is also built on our unswerving commitment in upholding the principles of a free market. As a free port and an open market, we are naturally a staunch supporter of free trade. We impose zero tariffs and we have no non-tariff barriers. Traders in all sectors, and from all jurisdictions, can trade freely in Hong Kong. The free flow of trade and capital makes us a champion of economic freedom, as well as a well-recognised international trade and financial centre. Together with free trade is the free flow of capital. Hong Kong maintains its own currency, which is fully convertible. Capital from the Mainland, and from all over the world, flows freely in and out of Hong Kong. The massive flow of funds through Hong Kong fuels a wide spectrum of financial activities. Our free society, our free flow of information, capital and talents make Hong Kong one of the most internationalised cities, and one of the best places for doing business. Apart from a free market, we also work relentlessly to maintain a fair market. Our market is open to everyone. Participants are encouraged to compete on a level playing field, regardless of where they come from. Again, a free and fair market is an indispensable aspect of our business environment, an enticing feature that attracts businessmen and investors from all over the world, and a key reason of Hong Kong's success. Ladies and gentlemen, the rule of law, our focus on education and talents, as well as our commitment to free-market principles have served Hong Kong well, and they will continue to do so. But for Hong Kong's economy to reach new heights, we must continue to seize fresh opportunities. Opportunities that I have in mind don't get any fresher, any larger or more promising, than the visionary and ambitious concepts of the Silk Road Economic Belt and the 21st Century Maritime Silk Road, or the Belt and Road Initiative, spearheaded by President Xi in 2013, right here in this university. The two corridors of the Belt and Road Initiative encompass some 65 countries across three continents, accounting for one-third of global GDP and one-third of the world's merchandise trade. It has been designed to promote, among others, infrastructural connectivity and, in so doing, boosting trade and investment, deepening policy co-ordination and creating stronger people-to-people bonds among participating countries. In short, the Belt and Road Initiative is destined to become the driving force of the global economy in this 21st century. It will generate demand and it will expand international trade and investment flow, as well as two-way traffic in Central Asia, Southeast Asia, the Middle East, Africa and Europe. Kazakhstan has a key part to play in the Belt and Road Initiative, given the country's location as the critical gateway between East and West. That's not surprising at all, given that Kazakhstan, and Central Asia in general, has served for centuries as the original Silk Road's East-West bridge. Today, with its vast land area and strategic location, Kazakhstan has what it takes to be the key business and logistics hub of the Belt and Road corridors. Hong Kong, too, sees unprecedented promises in the Belt and Road Initiative. Working together, I believe there is much our two economies can accomplish. There is clear and powerful synergy for our two economies to expand further our business collaboration and to enhance our growing ties. This is the reason why I have led a high-profile business mission to Astana. We are keen to learn more about your country, keen to deepen our bonds, and keen to expand business and trade relations between Hong Kong and Kazakhstan. I wish you all the best of business in your studies, and the city of Astana a successful Expo 2017. I do hope to have an opportunity to come back next year to see the Expo for myself, and to witness the transformation of this very site to become the international financial centre in the region. And I look forward to welcoming our Kazakh friends to Hong Kong.